Are you looking for a hipster retreat or a break from your studies? Grab your camera and an oversized sweater to catch a train from Poughkeepsie Station to Beacon: it’s time to visit Dia! If you present a Marist ID, your admission will be only $12 including a map of the space and a cool entrance tag. Even though I am an Art History major and happen to be acquainted with specifics of contemporary art, the motto of my visit to Dia this past Sunday was: you might need to be interested in art to understand it, but you do not need to be an expert to experience it. All you need to do is to open your eyes and appreciate the new visual vocabulary that was crafted for you by the leading artists of our age. Dia:Beacon is a part of Dia Art Foundation that mainly exhibits contemporary art from the period of the 1960s and 70s, grasping the leading representatives of Minimalism, Post-Minimalism, Abstract Expressionism, Pop Art, and more. Residing in the historic part of Hudson Valley, Dia catalyzes change, reshaping the conservative identity of the region and attracting a substantial flow of tourists and locals. It is not a traditional museum space where you look for a bench to land on and observe a centuries-old painting while resting your legs from the exhausting tour. At Dia, you get to saturate yourself in the celebration of visual and physical experience by taking an initiative to interact with the medium, scale, and format of the art displayed in almost surreal dimensions. The top three artworks that I suggest to visit are Richard Serra’s Torqued Ellipse waterproof steel sculptures (1996-2000), Francois Morellet’s No End Neon (1990/2017) installation, and Louise Bourgeois’s Crouching Spider (2003). As you enter Serra’s gallery, you draw yourself into an immersive, literal, and interactive presentation of four Torqued Ellipse sculptures that are lined up in the elongated space that used to be a railways depot back in the day when Dia was a factory. The warm, dappled light coming from the clerestory casts upon the steel surface of the monumental elliptical sculptures. Despite their scale, you get a feeling of movement as if it was a parade of cargo boats approaching the open waters. The sculptures promote the relationship between opticality and physicality of the object in space. The sculptures’ placement in the relatively narrow gallery instills the sense of power inviting the viewer to explore their internal structure. Walking inside of the steel carcasses made me shiver; I was situated in the physical space with its enormous interior pushing down on me. Due to this visual effect, the sculptures become optically enlarged, therefore ultimately enhancing their monumentality. 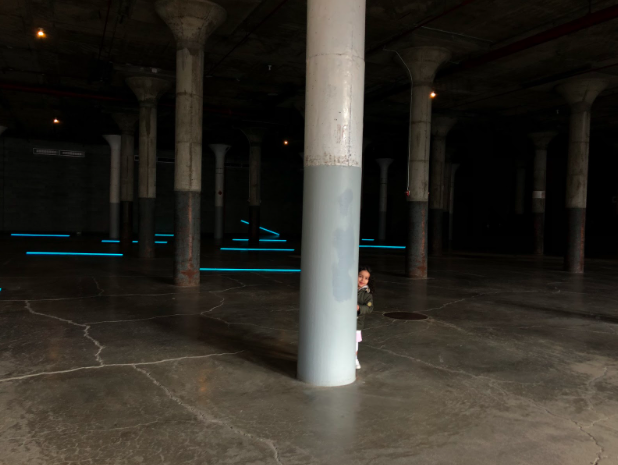 I was getting goosebumps all over my body as I walked through the mesmerizing, yet remote installation No End Neon by Francois Morellet with neon tubes scattered amidst the columnar, hypostyle space. The setting hypothetically could be utilized as an ‘Instagrammable spot’ or as a playground for hide and seek, as I noticed my friend’s little sister peeking from the side of the concrete shaft; however, it is essential to follow the original guidelines of the artist, where he stated how to walk through the immersive space systematically. The natural light source is reduced to the minimum to intensify the hazy, neon glow illuminating the path to the exit at the end of the hall. It feels incredibly isolated and existential as if you are placed inside of an escape room with one and only one path that is mandatory to walk. The attic level displays the collection of sculptures by an American-French female artist Louise Bourgeois who designed a spider monument made of bronze, black and polished patina, and stainless steel. With the compelling union between strong materials and scale, the spider appears vicious and threatening, yet elegant unexpectedly coming onto you. While looking at the sculpture, you should recall the image of the eight-legged monstrous creatures that you see in the sci-fi movies to come in a sense with reality because you are standing right in front of it. The Spider appears massive, occupying the majority of the exhibition display. However, there is something fragile about it having to deal with the sense of protection and guarding of its personal space constituted inside of the compact showroom. Dia:Beacon is a true discovery for anyone at Marist! No matter of your relation to art, you could find it appealing to your senses from the perspective of a viewer. Get out and see for yourself!